BARCELONA, Spain & SAN FRANCISCO--(BUSINESS WIRE)--Feb. 22, 2016-- MOBILE WORLD CONGRESS – Visa Inc. (NYSE:V) today announced it was making the Visa Token Service available to auto manufacturers, helping to pave the way for easy and secure car-based commerce. To further advance car-based commerce, Visa is also offering a range of related digital payment solutions, including new standards for Bluetooth (BLE) and QR codes that could help expand enablement of mobile payments for both merchants and consumers in any environment. As payments shift from plastic to digital, technologies built with Visa Token Service, provide an ecosystem of payment partners – from auto manufacturers to point of sale (POS) providers and beyond – a streamlined way to offer commerce and payments anywhere there is an Internet connection. 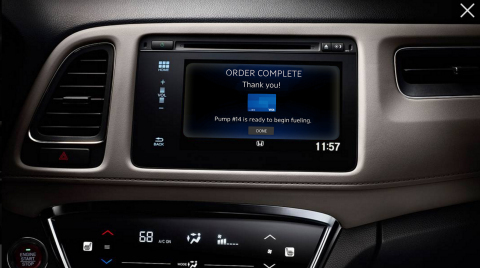 "This project demonstrates how apps can truly transform the in-car experience while creating new opportunities for automakers," said John Moon, developer relations lead for Honda Developer Studio. "At ParkWhiz we are very focused on creating a frictionless, and of course safe, parking experience for drivers," said Aashish Dalal, CEO, ParkWhiz. "Eliminating the need for drivers to take tickets or check out at pay boxes is a giant step toward a frictionless experience and a big win for drivers. ParkWhiz is thrilled to be partnered with Visa on this ground-breaking innovation."